The biggest surprise about the new project is that the film is being written by Jason Segal (How I Met Your Mother) and directed by Nicholas Stoller — the team behind this weekend’s R-rated comedy Forgetting Sarah Marshall. 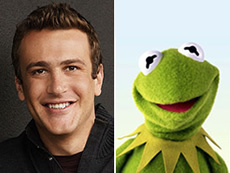 Considering that Disney is known for producing overly-homogenized projects, it’s refreshing that a new Muppet movie will be produced by the “hip” duo. There’s no release date from Disney as yet but Segal is known for writing quickly so the project is likely to move right along. The current plan is to head into production as soon as Segal completes filming I Love You, Man this summer. The Disney company has been anxious to find a way to successfully relaunch the Muppet characters since they acquired them in 2004 so it’s doubtful they’ll be dragging their feet. Stay tuned! The Stork, The Guinea Pig & The Elephant » Blog Archive » More Muppets! […] the best piece of news ever!